It's hard for many of us to talk about money. Money conversations can be stressful and awkward, and you may be tempted to just stay mum on the subject. However, it's vital that you pass financial wisdom on to your kids, even when they're adults. It's important to teach them about money growing up, but there are some things better discussed when they are older. Here are the money conversations you should be having with your adult children. If you are supporting your adult children and you'd like to stop, or if you want to avoid it altogether, it's important to set up some financial boundaries. If you don't want to support them financially at all, tell them that up front and stick to it. That way, you won't end up paying for things and resenting it. If your adult kids are relying on you for part or all of their financial support, sit down together and form a plan. Cutting them off entirely probably won't work for either of you, but you can start slow; back off on payments over the course of six months to a year, and set up concrete steps along the way. For instance, you may decide to stop giving them "fun" money right away, but be willing to cover their cellphone plan for six more months. 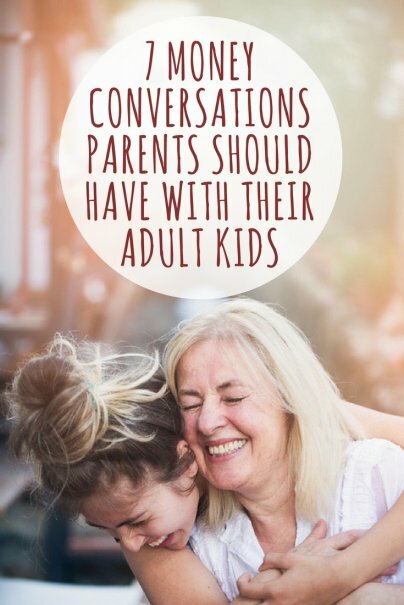 Have a conversation with your adult child about what they want in life and how much those things will realistically cost. This is the time to talk about the financials behind car ownership, homeownership, traveling the world, and more. Make sure they have an understanding of how much money they'll need to have in order to afford the lifestyle they want, and how much they need to make in a week, a month, and a year to achieve that. Talk to them, also, about what is really important in life. Tell them that fancy cars, big houses, and lavish vacations aren't the keys to happiness. Ask them to think about what they would pursue if they were dying or what they would miss most if they suffered a serious injury. This can help them figure out what is important to them and what they may not be willing to trade their time and money for. Your adult kids need to understand the importance of spending less than they earn. Show them how to calculate this so they can determine for themselves when to spend their money and when it would be better to save or invest it. Your kids need to figure out how to sacrifice spending on superfluous things in order to live a financially secure life. In a culture where credit is readily available, your kids need to know how to evaluate different credit opportunities based on benefits and drawbacks, as well as how to wisely use credit. As soon as they are old enough to obtain financing of their own, you need to talk with your kids about credit cards, educational loans, personal loans, and home loans. As your kids get older, they also need to know about your financial plan, before they find themselves trying to figure it out without you. This can be an especially difficult conversation to have, because on top of talking about money, you're also talking about serious injury, illness, or death. If one of your adult children is the executor of your will, make sure they understand that responsibility and that they have all the relevant information. They should have access to the location of your accounts, the account numbers, and any identification information, as well as contact information for your lawyer. You can write all of this out for them so they can simply file it away until they need it. Talking about money can be hard, but it's also important. Speaking with your adult children about these topics will ensure they have a better chance at a financially healthy life.